Riverine ecosystems belong to the most threatened ecosystems in Europe. 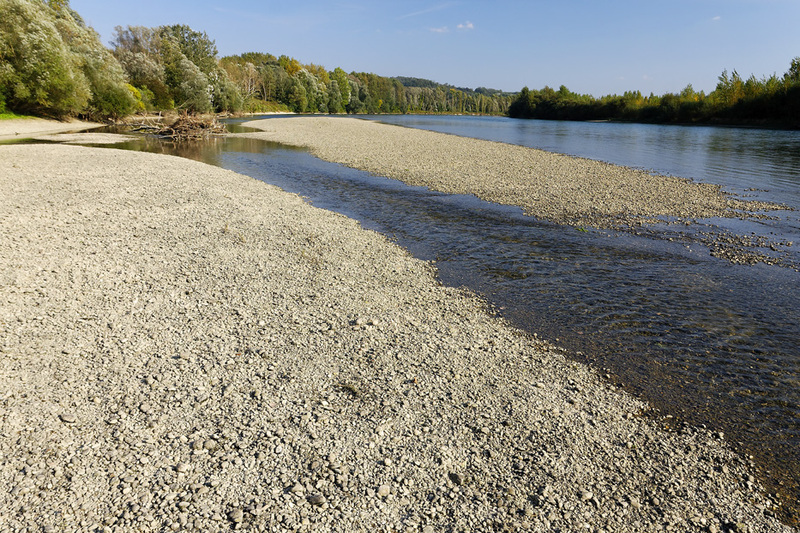 Within the project area, the Drava is one of the last semi-natural rivers in Central Europe. The construction of 22 hydropower plants in Austria, Slovenia, and Croatia crosscut the river and left only a small free-flowing section, mostly in Croatia. The DRAVA LIFE project area covers a length of 310 km, and includes 4 Natura 2000 sites in an area of 67.800 hectares from Dubrava Križovljanska (rkm 322,8) to Osijek (rkm 15). Except for the part from Osijek to the confluence with the Danube (Kopački Rit Nature Park), the whole length of the Croatian Drava is included in the project. Within the project, key natural features of the riverine ecosystem will be restored through an inter-sectorial cooperation between Hrvatske vode, public institutions for nature protection and NGOs, who will showcase this innovative approach of river management on several sites along the Croatian Drava. The planned restoration actions encompass the opening and creation of new side-arms, the removal and modification of embankments and groins, as well as the preservation of retention areas and natural steep river banks. This will significantly benefit numerous types of endangered habitats and species within Natura 2000 sites. The restoration of side arms and channels is favourable for flood control within the existing floodplains. These measures positively influence the lowering of high water levels locally, and divert the water away from settlements, bridges, roads and dikes. Furthermore, these measures comply with flood risk management regulations (EU Flood Directive). Restoration on the pilot Drava sections (C1-C7) will be carried out without endangering the safety of the existing flood control system and individual structures. The actions will consist of the widening of side-arms within the dike or high bank, the dismantling and modification of existing parts of regulation structures and the implementation of new, environmentally friendly methods for flood protection. Such restoration methods are a part of nature conservation and sustainable flood protection and pose a particular challenge for all project partners. The project will also have a positive effect on groundwater supplies, as the restoration actions will improve the river water infiltration into the groundwater and thus stabilize and lift groundwater levels. This will also increase the resilience of Drava’s floodplain ecosystems to combat negative impacts of climate change. Furthermore, the project will increase the recreational value of the area for local people, who use the area for e.g. fishing, swimming and relaxation. Podravska Moslavina (96 – 98 rkm). During the implementation, partners will also set up educational centers and educational paths along the Drava River and in addition implement visitor guidance actions. Moreover, several exhibitions and extensive awareness raising activities will be organized in cooperation with local citizens and schools. The DRAVA LIFE project has started on 1st December 2015 and will end on 30th November 2020.